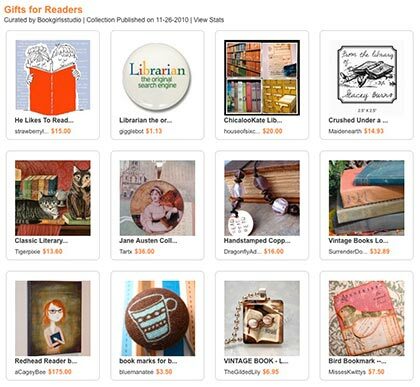 I’ve been playing on Artfire with making collections and I thought I’d share some of the bookish goodies I found that would be perfect for the bookworms in your life, that is if you aren’t all shopped out from Cyber Monday. Ha. Aren’t these great? You can click here to see the items in more detail. Someone had asked me recently if I had a shop on Artfire and I do (my Artfire shop) although it’s not as stocked up as my Etsy shop. I’m still trying to decide actually if I want to have the same items in both shops or maybe have some differences between the two. I guess I can think on that as I continue to create. Anyway, tomorrow I’ll try to share the list of books I’m thinking of asking Santa to bring me. Thanks for all of the helpful suggestions for holiday shopping! So many fun bookish things and so many creative people! A very good list. I have not really shopped on Artfire so I will have to take a peek around. 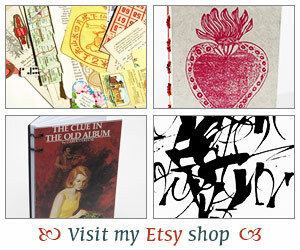 Great bookish gifts. I like the Jane Austen pendant, very cute!